Wader Quest: Little Curlew tracking, a new season begins. Little Curlew tracking, a new season begins. In recent days we’ve started to see the beginning of the northward migration of the little curlew in north west Australia. The map below shows the current location of all six birds, which are carrying satellite transmitters. 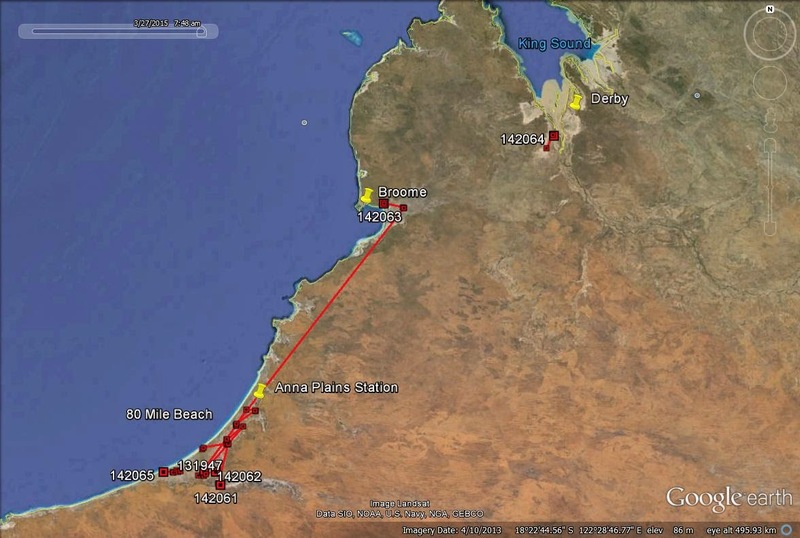 Five of the transmitters were put on little curlew in February this year on the plains about 30 km south of Anna Plains station (two) and on the adjacent 80 Mile Beach (three). Since then these birds have moved around on Anna Plains station between an area close to the station itself right down to the southern end of the station (where it adjoins Mandoora station, about 100 km south), opposite the Sandfire station. After yo-yoing around and mostly being at the northern end of this area last week, three of these birds have this week returned to the southern end of the station. More interesting the other two have moved 200-300 km northwards in what appears to be the first stage of their northward migration. One is on Roebuck Plains and roosted on the plains only just behind the Broome Bird Observatory. The other bird has moved rather further north and is on the Fitzroy River floodplain close to King Sound at Derby. Similar northward movements from Anna Plain station were recorded last year in second half of March. Little Curlew with leg flag DN fitted with satellite transmitter 142061 16th February 2015 Anna's Station Western Australia, Australia. Photo: Tz-Yu Liao. 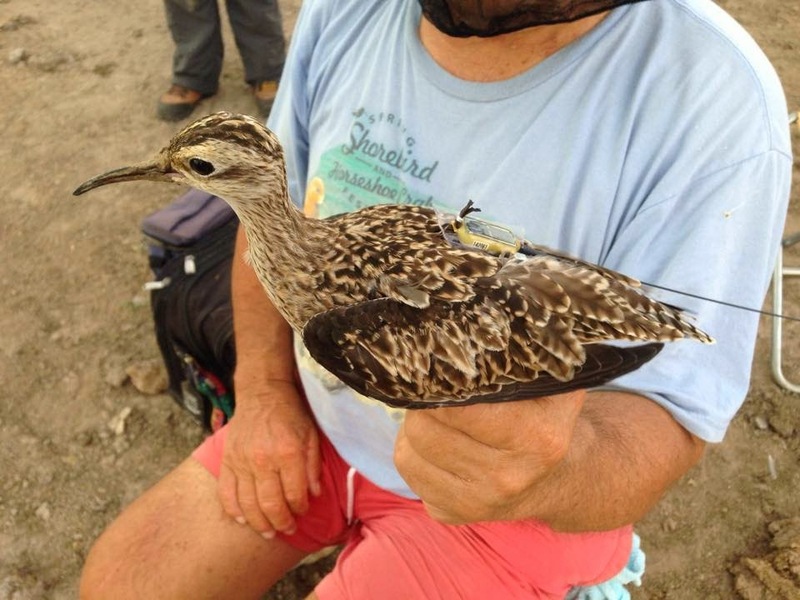 We also have one transmitter still operating from the five little curlew on which satellite transmitters were deployed in November 2013. You will recall that this bird has spent most of the 2014/15 non-breeding season on saltmarsh to the northwest of Kununarra. In recent weeks it moved down first to Roebuck Plains, then to Anna Plains, then back to Roebuck Plains and then back again to Anna Plains! It is now at the southern end of the station in the same area as the other three little curlew carrying satellite transmitters put on this year. 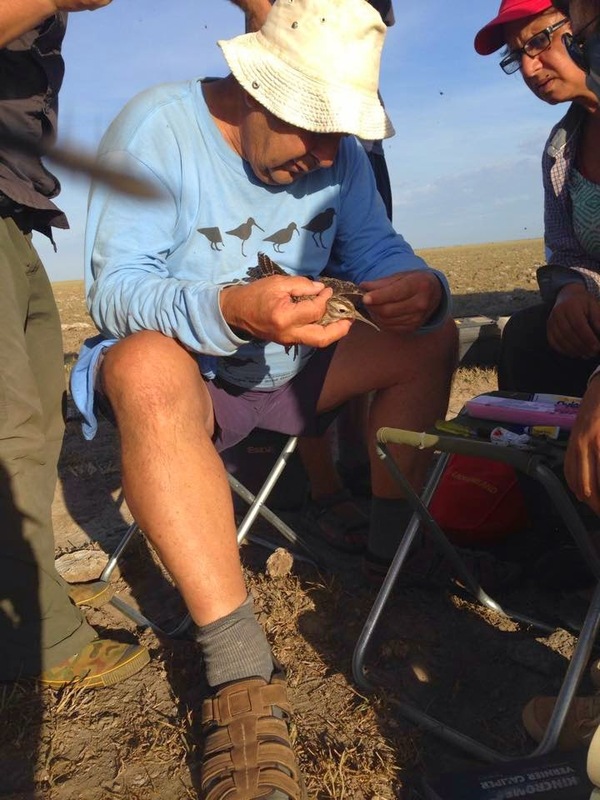 Clive Minton processing a Little Curlew. It will be interesting to see if all of the little curlew move up to Roebuck Plains/Fitzroy River floodplain before their departure from Australia. We will keep everyone informed of any further significant movements. Do please be patient – no news is NO NEWS! One of the frustrating parts of setting the excitement of following migration with satellite transmitters on birds, is the long periods when nothing happens because a bird is resting at a stop over location or is only moving around locally in an area. However, with six birds now carrying satellite transmitters in circulation hopefully there will be plenty of highlights over the next few weeks .